The steel-aluminum design on this affordable speaker stand make it both lightweight and durable. Use either the 1 3/8" diameter upper shaft or the included 1 1/2" adapter sleeve for a universal fit. - Universal fit with 1 3/8" or 1 1/2" inserts. - Tension height adjustment knob and safety pin for added safety. - Locking/Retractable leg housing with 120-degree design for low center of gravity and equal weight distribution. - Height Adj. : 44" - 80"
- Weight Capacity: 160 lbs. - Upper Shaft Tubing: 1 3/8" or 1 1/2"
- Base Spread: 32" - 48"
"A good product for the price." Sound: its a speaker stand! Feature: sturdy and it works Quality: well made? yes. Value: its a good deal. I got one free with a power speaker. Manufacturer Support: haven't had any problems. I have two of these stands. The Wow Factor: Well if you are not using stands you are loosing music. my powered speakers sound better on the stands Overall: I don't like buying speaker stands but they are a necessity. Style of Music: 50's, 60's rock blues country...some jazz. 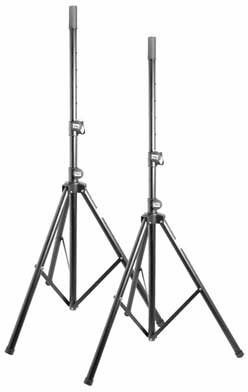 "On Stage SS7730 Tripod Speaker Stand"
Overall: These stands seem to be strong enough to keep my Mackie Thump 15's flying high. Even in windy conditions. So I give them a strong 5 stars.